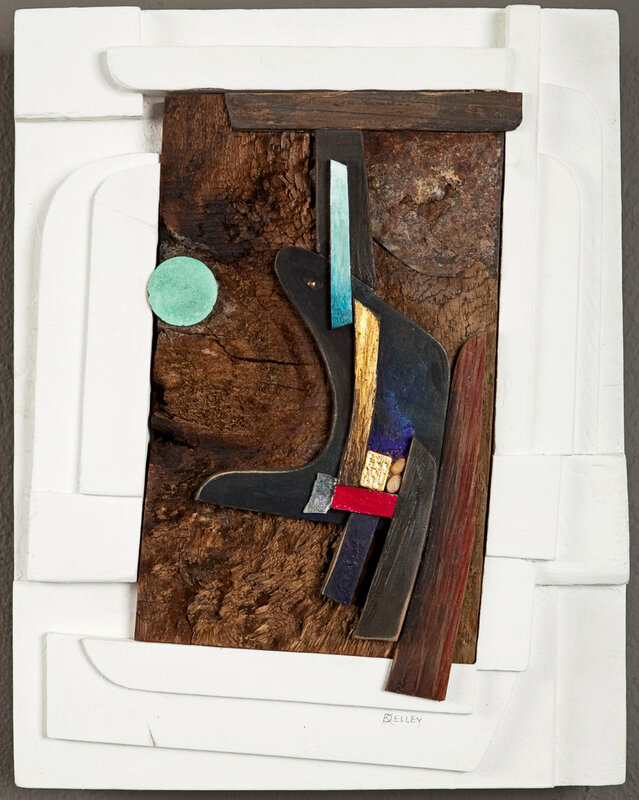 Kelley’s sculptural assemblages are about discovery. Using a palette of old wood, metal, gold leaf, cloth, glass, rocks, and other materials these works are grounded in the unearthing of another time—attempting to re-create the excitement of a kid reading about the discovery of Machu Pic­chu in Peru by Hiram Bingham in 1911; King Tut’s Tomb in Egypt by Howard Carter in 1922; the uncovering of the history of the first Native Americans or the countless other archaeological discoveries from around the world. Graduating with a BFA degree from the University of Texas in 1953, Dwain Kelley studied under some of the most respected artists and educators in America. He started showing alongside and competing with some of these same professors while still in college. Over the years Dwain was accepted in thirty-six regional, national and international art exhibits, winning purchase prizes or awards in twenty. All of these works were either watercolors or drawings but his very first Texas solo exhibition was of his sculptural assemblages in 1967. In 1954 he enlisted in the army and was sent overseas to Germany the next year. His wife Billie was able to join him there and they lived in the small attic of a house in the 700 year old village of Schwaebish-Hall where he spent many nights painting and drawing. These works lead to a solo exhibition on the army base that later traveled to Crailsheim and Munich. Upon returning to Austin in 1956 he took a position as Art Director at Von Boeckmann-Jones, a printing firm founded in 1874. While working there he designed printed material for universities and companies across Texas. After the closing of the printing company in 1972 he founded the design firm Kelleygraphics which is celebrating its forty-fifth anniversary this year. Kelleygraphics portfolio includes twenty-five years of designing all the print graphics for the Texas Exes Alum­ni Association; thirty-eight years of the Texas Electric Co-Op magazine; nine years of the Texas Parks & Wildlife magazine; and many, many other books, magazines and corporate design projects with his design associate of almost thirty-five years, Mary Barminski Johnson. Although he still designs, paints and draws, over the last ten years he has focused his creativity on the sculptural assemblages he first began constructing in the 1960’s…and he is still married to Billie!